New staff members at GCU tend to jump into the community headfirst. They are devoted to the students, and they have a closet full of purple T-shirts and their own spot in the bleachers at games. You can see them at Chapel and having lunch in the Student Union. Staff members want to be available to students. When Tim Griffin joined GCU in August 2010 as campus pastor, he wanted to be so available that he moved into North Rim Apartments with his wife, Robin, in tow. GCU Vice President of Student Services and Dean of Students Tim Griffin. The couple will celebrate their 29th wedding anniversary in November, and this isn’t the first time they’ve lived as a married couple on a college campus. Tim, who will speak at Chapel on Monday, joined GCU after more than 10 years as chaplain of the NASCAR Sprint Cup Series. He wrapped up his last few races during his first semester with GCU, often flying home on Sunday to attend Chapel on Monday morning. Taking that same approach, the Griffins moved onto the GCU campus. At the same time, their youngest son, Spencer, was preparing to join his older brother, Taylor, at GCU. Most kids leave the nest, but rarely does the nest follow them to college. According to Tim, Taylor had been out on his own for a few years and appreciated the availability of Mom’s home cooking from time to time. But Spencer was not quite so excited to have his parents hanging around during his first year. After finding a balance in the family’s first year on campus, Tim spent much of the past summer alone. The rest of the family returned to Tucson to wrap up affairs before becoming full-time Phoenix residents. In August, he was promoted to vice president of student services and dean of students. 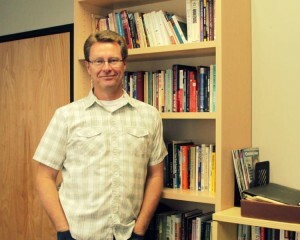 He has continued as campus pastor. In his new role, he oversees the offices of Spiritual Life and Student Life, Career Services and Event Services. His focus is on communication, cooperation and attitude — the three components he says are key to serving students well. “It’s all about attitude and how you embrace the new phases of life,” he says. Tim’s excitement about all of the new amenities on campus, from Thunder Alley to the intramural fields to GCU Arena — which he describes as “a big venue built for big experiences” — complements his desire to make campus a unique community for students. The Griffins won’t be living on campus for much longer. With the demand for campus housing so high, Tim doesn’t want to take up space that could be used for students. Robin also has appreciated the opportunity to live on campus and experience student life. She is working on finding a new home for the family in Phoenix. “I am excited about our future and hope that this will signal the beginning of a long-term relationship with the University,” she says. Tim is wrapping up a doctorate in religious studies with Trinity College and expects to be finished in 2012. It has been 12 years in the making. Reach Zane Ewton at 639.7086 or zane.ewton@gcu.edu.